On January 6, a mob of 50 to 60 masked men caught 16-year-old Abdul Kareem Khatri and his uncle Dawood Khatri in Bagh village of Madhya Pradesh as they were returning from the mosque after evening prayers. Both were mercilessly thrashed by "RSS men". An FIR was filed. But no arrests were made. Three days later on January 9, around 10 to 15 masked men on motorcycles set fire to the Khatris' workshop. The family identified the men. A case was registered against them under Section 325 of the IPC and some other sections, which the family is not aware of. No arrests were made. The Khatris look like ordinary folk - but they have an extraordinary skill. The famed Bagh Print fabric was created by Dawood's father Ismail Suleymanji Khatri after he moved to Bagh village in Dhar district in the 1950s. Khatri Senior was decorated with several awards, including a National Award in 1984. Except the family didn't rest on those laurels. He passed the legacy to his children, who went on to enrich it further. Today, the family counts among the most unique in India - all the adults of the family are National Award winners for excellence in craft. Khatri's wife Hajjanni Jetun Bi, also a National Award winner, is an expert in vegetable dye making. Khatri's five sons - Umar Farrukh, Mohammad Yusuf, Mohammed Rafiq, Mohammed Dawood and Abdul Qadir - each pursue the craft with the same passion as their father did till he passed away in 2014. Today, though, a feeling of fear has gripped the family. Umar Farrukh is 36 years old. A month after the attack on his brother and nephew, the wounds are still raw. "You should see the way Abdul's elbow has fractured. The right hand has split open. We don't know if it will heal properly," Umar told Catch. Also read: Why has Uttar Pradesh become a communal tinderbox? Abdul's uncle Dawood sustained serious head injuries and multiple fractures. They were attacked with rods and swords. 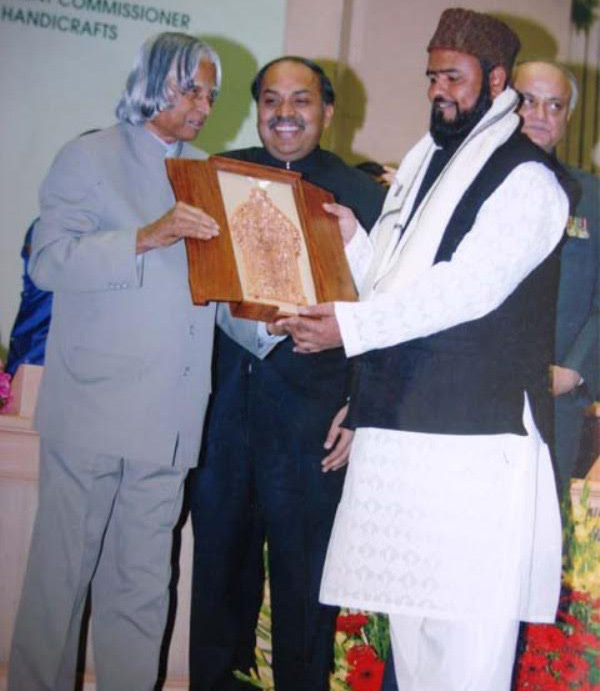 Ironically, Dawood had received a national award for his work just a few days before the attack. The violence in the area was sparked by an incident of "eve teasing" which escalated into a communal clash. The Khatri family was not the only one in town to suffer. Four other shops belonging to Muslims were looted and burnt. This is the first time in 60 years that the Khatris say they have experienced fear. Asked if he fears more attacks by the "RSS men", Umar said, "You cannot change anybody's nature. You think they will change?" The family has been considering moving to the US to escape their wrath. "My father and my brothers have exhibited in America several times. We know that our craft is respected there and that people do not get attacked there," he says. However, the family is painfully unaware of the procedural requirements for settling in the US. They are not even sure how they would continue to work making their Bagh print there. And if not Bagh, then what? Bagh is a small village around 100 km from the district headquarters of Dhar. It has a rivulet passing through the town called the Baghini - which is where the fabric is treated before the symmetrical and usually floral Bagh print motifs are embossed on beautiful silks and cottons. 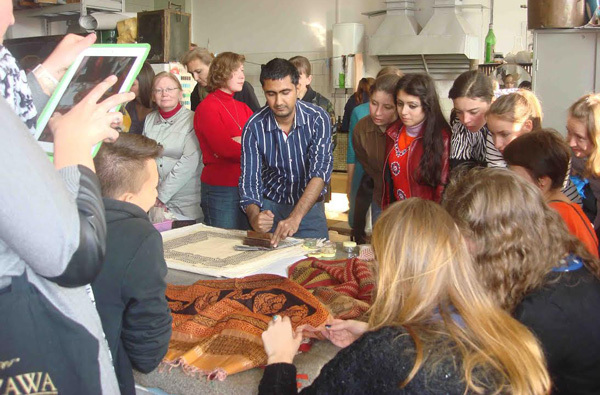 Bagh printing is a water-intensive process involving repeated soaking, boiling, drying, washing and printing. 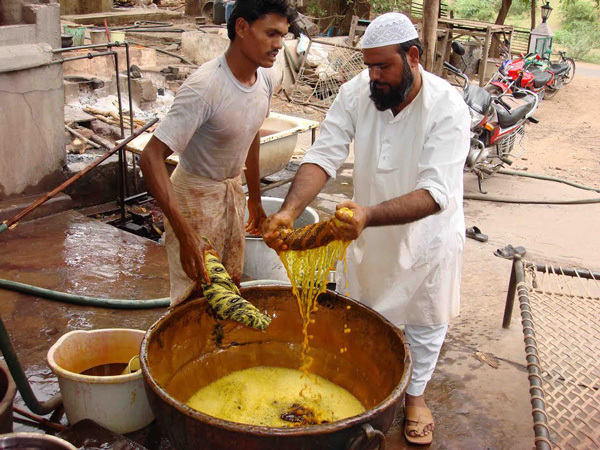 The fabric is soaked in raw salt, hot water and goat dung - which gives the cloth a yellowish tinge. The fabric is then washed and dried. 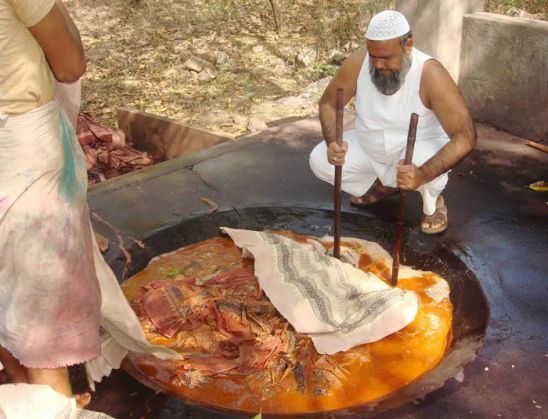 The typical Bagh red colour is extracted by soaking and boiling tamarind seeds and alum in a copper vessel. The fabrics are treated with a host of natural ingredients. Also read: Bloody record: Is 'secular' SP more communal than the BJP? In the 1960s, when the lure of synthetics was high and many artisans left the craft, Khatri Senior stuck to his vocation. He began to redefine the process. He acquired blocks that are about 200 to 300 years old, based on traditional motifs inspired by the 1,500-year-old cave paintings of the region. The Khatris aren't the only ones who make Bagh prints today - other families in the village with a population of around 10,000 have learnt the craft too. But the Khatris are the most skilled, and the best-respected of all the craftsmen in the area. They supply government emporiums and are invited to exhibit their craft at venues ranging from Bhopal's Gauhar Mahal to Delhi's Dilli Haat to Santa Fe in New Mexico. Umar wants to relocate to Santa Fe in New Mexico. He hasn't been there, but one of his older brothers has. There is a rivulet there and Umar thinks they would be able to keep making Bagh prints. For now, he is hoping that the Khatris won't get blacklisted from government forums. And counting on Madhya Pradesh home minister Babulal Gaur's word that the government will make sure the family is safe. It's not words that worry the Khatris. It's actions.